Elliot knew from our first session together that I saw him as basically a good person. As he remembered it later, he had told me his personal saga of relationship and work failures, and he expected I would conclude, as he had, that he was pretty hopeless. Instead, I said something like, “Oh, you’re not so bad.” I don’t remember saying that, but, as he told me, he had understood that I really did believe in his goodness. “That’s why I kept coming back,” he said. I’m often asked by clients like Elliot what to expect from someone who describes herself as a “contemplative psychotherapist.” Here are some of the key principles of contemplative counseling and psychotherapy that I would outline for a potential client. As I have studied and practiced mostly in the Vajrayana tradition of Buddhism, what I say here reflects that school’s approach. Contemplative Psychotherapy is based on the view that all of us, no matter what our problems, are fundamentally awake and healthy. In some schools of Buddhism this is called our buddhanature, and in the Shambhala teachings it’s called our basic goodness. In the Contemplative Psychotherapy program here at Naropa University, it’s referred to as brilliant sanity. The contemplative approach is an optimistic one, because it points to our capacity for clarity, compassion, mindfulness, and awareness. The premise of Contemplative Psychotherapy is that we already have what we need to connect with our inherent wisdom and compassion. Therefore, a contemplative therapist is concerned primarily with helping clients reconnect with and develop confidence in their own inherent sanity. We are not, of course, always in touch with it—we have only to look around us to see there is much suffering, confusion, and violence in the world. Yet the contemplative approach is an optimistic one, because it points to our capacity for clarity, compassion, mindfulness, and awareness. The experience of brilliant sanity cannot be completely captured in words. Instead, we tend to glimpse it in moments of clear-seeing and tender-heartedness. We might have a sense of being fully present when something surprises us. We might experience it in a time of unexpected joy, or in a period of intense grief or fear. In such moments, we are simply right there with an open heart. Such glimpses have qualities of sharpness, tenderness, and letting go of thoughts. They might last just a few seconds, or they could last a lot longer. For example, when people are about to have a car accident, they may see precisely what’s happening and take whatever steps they can to avoid further damage. They might feel slowed down and very clear. Then afterward, they might have lots of thoughts crowd in about what might have happened. They might have angry thoughts or frightened ones. As they get caught up in their thoughts, they lose touch with the sense of immediacy and clarity that characterize glimpses of brilliant sanity. Of course, contemplative therapists are interested in their clients’ stories, thoughts, and past, but they are less likely to turn therapy into an intellectual exploration of what went wrong and whom to blame. They are more interested in how what happened in the past is still manifesting in the present, not in the past for its own sake. If we have fundamental sanity, why are we so out of touch with it? 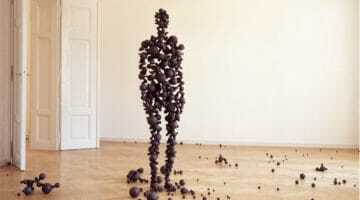 Buddhism teaches that it is because we mistakenly believe we have some kind of solid and fixed identity. Sometimes this is called “ego,” but it is the same way the word is used in Western psychological theory. Unfortunately, this causes a lot of confusion. The common use of the term “ego” refers to a sense of agency, an ability to use logic, or an ability to know one’s experience. These are not a problem. What is a problem is our attempt to create and hang on to our sense of self as permanent, separate, and solid. This is the way Buddhist psychology uses the word “ego.” Buddhism teaches that we don’t have such an identity, and all attempts to maintain it are doomed to failure because we are actually made up of experiences that keep changing. The good news is that by letting go of our struggle to maintain a fixed sense of self, we can be more creative, flexible, and responsive to what arises in our experience. A mistaken idea many have about Buddhism is that it’s about giving up ego. But we don’t have to give up something we don’t have. From the contemplative viewpoint, we never actually had such a fixed identity, so there’s nothing to give up except our mistaken beliefs about it. The good news is that by letting go of our struggle to maintain a fixed sense of self, we can be more creative, flexible, and responsive to what arises in our experience and in our relationships with others. Another mistake we make is believing we are completely separate from each other. However, our experience is always interacting with and being influenced by the environment and other people. Thich Nhat Hanh says that we “inter-are.” Modern neuroscience also points out this interdependence. In the language of Contemplative Psychotherapy, we exchange with each other. If I am working with a client who feels very angry, I might start to feel the bodily signs of anger in myself. I might feel agitated and hot; I might start to have angry thoughts. There could be several things going on, but one thing is that I could be exchanging with my client. It can be a relief for some clients to learn about exchange, because it can help them make sense of past experiences. A client of mine grew up with a very depressed mother who could barely get off the couch most of the day. Realizing that she was exchanging with her mother helped my client let go of her belief that she was inescapably fated to being depressed herself. 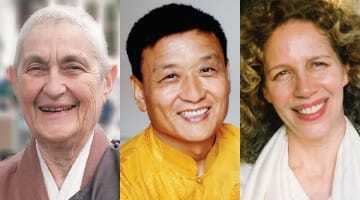 The earliest teachings of Buddhism are about how suffering arises and how it can be reduced. The Buddha taught that there is pain simply in being alive. But he also taught that we add unnecessary suffering by trying to grasp that which inevitably falls apart, like our identity or anything material we think will bring us happiness. So Buddhist psychology makes a distinction between the inevitable pain of being alive—the pain of birth, old age, sickness, and death, according to the traditional Buddhism formulation—and the unnecessary suffering that results from our attempts to escape or deny reality. These include our misguided attempts to maintain a solid identity, to escape unavoidable pain, and to aggressively reject what we don’t want. Blaming ourselves for being ill or experiencing pain is fertile ground for more unnecessary suffering. Sometimes people complain that Buddhism is negative because it teaches that pain is inevitable. What I have seen is that knowing pain is part of being alive can be a big relief. It means that being in pain is not a sign that we have done something wrong. Many of us are quite well-practiced at self-judgment. Blaming ourselves for being ill or experiencing pain is fertile ground for more unnecessary suffering. Whatever the sources of our pain are, including oppression and injustice, we need to take responsibility for how we respond to them. For example, internalizing the messages we might receive about being lesser because we are a member of a marginalized group can be particularly difficult to recognize and address. Undoing such damaging beliefs about ourselves is part of the path of reclaiming our natural wisdom and compassion. The Buddha taught that the way to stop perpetuating the habits that cause us unnecessary suffering is to bring mindfulness and awareness to all aspects of our lives. 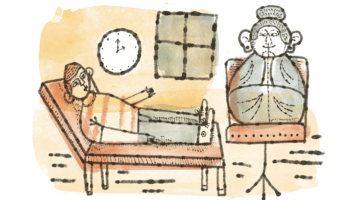 In contemplative approaches to therapy, counselors work with their clients to develop mindfulness—the ability to bring nonjudgmental attention to the details of our experience. This means paying attention less to the content of our thoughts and more to what is happening in the present moment. When I work with clients, I listen for what they already know about developing mindfulness. Many clients know a good deal. For example, anyone who has a disciplined approach to playing the piano, or practices the specific skills of basketball, or cooks attentively, or knows a lot about butterflies already knows how to attend to details and to let go of mistakes. So together we explore how to bring what they already know to whatever issues they are dealing with. Awareness is a larger sense than the close attentiveness of mindfulness. It is helpful for clients to learn to take a larger view. I had one client who learned to ask herself “How else could I look at this?” To do that, she would “back up” and see if she could find a different perspective. Often this led her to find humor in how she was approaching the problem. It freed her up to become more creative. In addition, contemplative therapists are interested in helping their clients cultivate loving-kindness. At Naropa we use the Sanskrit word maitri to refer to the unconditional loving-kindness that we can bring to all aspects of our experience. It is the opposite of self-aggression, which unfortunately is rampant in much of society. With maitri, we bring a warm heart and curiosity to whatever we are feeling, doing, and thinking. Contemplative therapists are interested in recognizing brilliant sanity in its many forms and disguises, and especially in seeing the wisdom within confused emotions. The approach to working with emotions in Vajrayana differs somewhat from that of other Buddhist traditions. Instead of regarding our emotions as a problem to get rid of, the Vajrayana view is that emotions, even those we regard as “negative,” contain wisdom that we can tap into. Instead of trying to get rid of emotions, we can bring curiosity, mindfulness, and loving-kindness to them. Usually, we try one of two unsuccessful strategies to work with our emotions. We either try to get rid of them by repressing or ignoring them or we try to get rid of them by acting them out. Neither way works very well. Repressed emotions have a way of turning into bodily tension and illness or of popping out at inconvenient times. We may find ourselves exploding into tears over something unimportant because we have tried to push away our sadness over something else. On the other hand, acting out emotions tends to intensify them and often leads to problems in relationships. It can even lead to violence when we become carried away by the energy of anger. Instead of trying to get rid of emotions, we can bring curiosity, mindfulness, and loving-kindness to them. Going toward the direct experience of our emotions lets us get to know them well. We might find that within anger, for example, lies much clarity. Before we can get mad about something, we have to see it first. So instead of attaching a story line to the anger about how something supports our sense of identity or not, we can simply feel what we feel and then see what to do next. With its emphasis on direct experience and understanding interdependence, Contemplative Psychotherapy naturally pays attention to the relationship between therapist and client. In fact, a genuine relationship is a key healing factor in therapy. A genuine relationship between psychotherapist and client is one that is free from deception and, at its best, the confusion of clinging to any solid identity. Research supports the idea that the relationship between the people engaged together in therapy is the most important predictor of success. If therapists bring mindfulness, awareness, and loving-kindness to their own experiences, the client may experience those qualities, too. The principle of exchange offers us some ideas about what happens in therapy, and therapists who aren’t familiar with it are likely to misunderstand what is going on. If, for example, therapists start to feel afraid during a session, they might conclude that a client is frightening them. But a therapist who understands the dynamics of exchange might be curious to see if the client is feeling fear, which the therapist might also be experiencing. Another aspect of exchange is that it goes both ways. Not only does the therapist pick up on some of the client’s experience, the client also experiences exchange with the therapist. So if therapists bring mindfulness, awareness, and loving-kindness to their own experiences, the client may experience those qualities, too. This is a big part of what clients find valuable in contemplative therapy, because they are met with a nonjudgmental and welcoming atmosphere that is a helpful foundation for working with their pain. How can therapists provide all that nonjudgmental mindfulness, awareness, curiosity, compassion, and loving-kindness? By far the most important thing they can do is to have an ongoing mindfulness–awareness meditation practice of their own. Spending time on a daily basis being present with themselves and practicing letting go of their own confused thoughts and mindlessness is a powerful way for therapists to know themselves well. Therapists who practice mindfulness–awareness meditation are less likely to confuse their own issues with their clients’. They are more able to recognize the difference in themselves between having a direct experience and thinking about an experience. Their practice helps them cut through any tendency to latch on to a fixed identity about themselves as better than or fundamentally different from their clients. Finally, meditation gives them the opportunity to make friends with themselves so that they can help their clients to do the same. 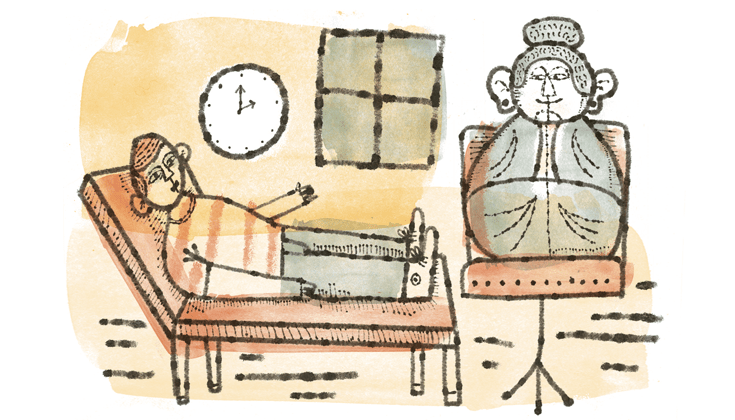 Now that I’m doing Buddhist meditation, should I give up therapy?